seconds and discuss qualitatively with Parents. With our School Software, Detailed information about your School is just a click away. 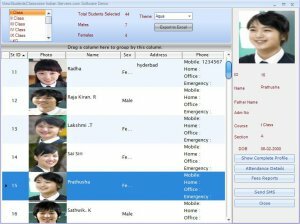 Subject wise attendance, Late Presents and Early Leaves of Students and Faculty, RFID, Biometric, Password based attendance System, Regular Late Comers. self-comparison with previous tests with previous tests 15 graphical printable charts, Exam to exam comparison for a class. Faculty Complete profile, Faculty performance based on student exam results, Faculty attendance, Salary statement, Search. management, Files and resources management, Gate pass. Get in Bus stop for individual Students, Drop Bus stop for individual students, Fuel Management, Drivers Management. Books Issues, Books Return Including fine, Due Date book returns, Books Search, Import from Excel. company has operations and customer base spanning including software development in India. We support you lively, Mobile support, Web Support.